The radioactive cloud which was observed on March 15th and 21st. 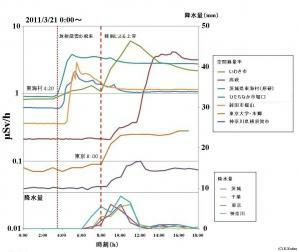 The Fukushima Plant caused meltdown on March 11, and two radioactive clouds were observed in Tokyo a few days later. 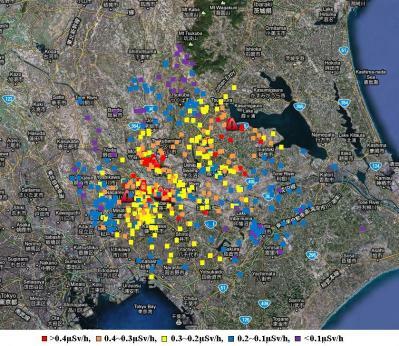 As follows, the details about the radioactive cloud landed at Kashiwa-shi in "Tokyo". A big radiation dose is observed on 15th and 21st. ・ What kind of radioactive material came? A very big peak was observed on 15th (Fig.1). However, if anything, radiological Cesium, Iodine enlivening the world (news, TV) including the vegetables pollution have more 21st. It is found that the main ingredients were Xenon (Xe-133) on 15th,　on the other hand, Cesium (Cs-134,137) and Iodine (I-131,132) on 21st. These two are totally different phenomena. Xenon-133 is rare gas, and there is characteristic having a low energy. Therefore even the radioisotope examination "Lung Ventilation Scintigraphy" of the hospital is used. 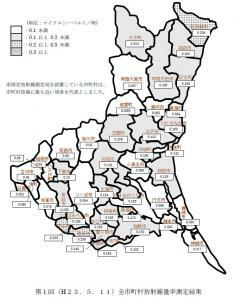 Because the main ingredients are Xenon-133, and it is considered that it was hardly absorbed in the human body, as for the radioactive cloud which came on 15th, it may be said that the quantity of civic radiation exposure was relatively minimal. However, as for the radioactive cloud on March 21st, the ingredient changed completely, and it is considered that the nuclide had easily the characteristics accumulating on the human body and the land. The radioactive cloud of this 21st wholly polluted the Kanto (Tokyo) area, and it caused the pollution of lands and vegetables, and it is thought that I bring unknown influence to the human body from now on. 2. 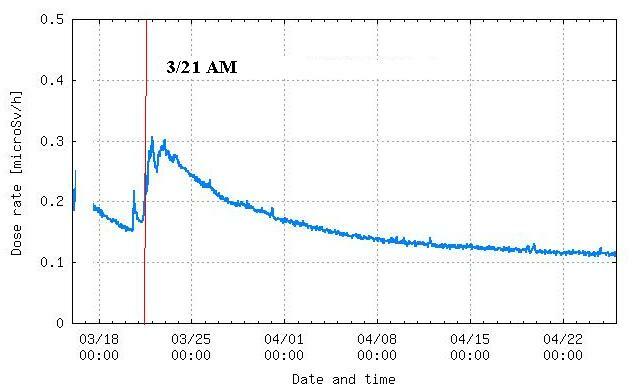 What happened in 3/21? 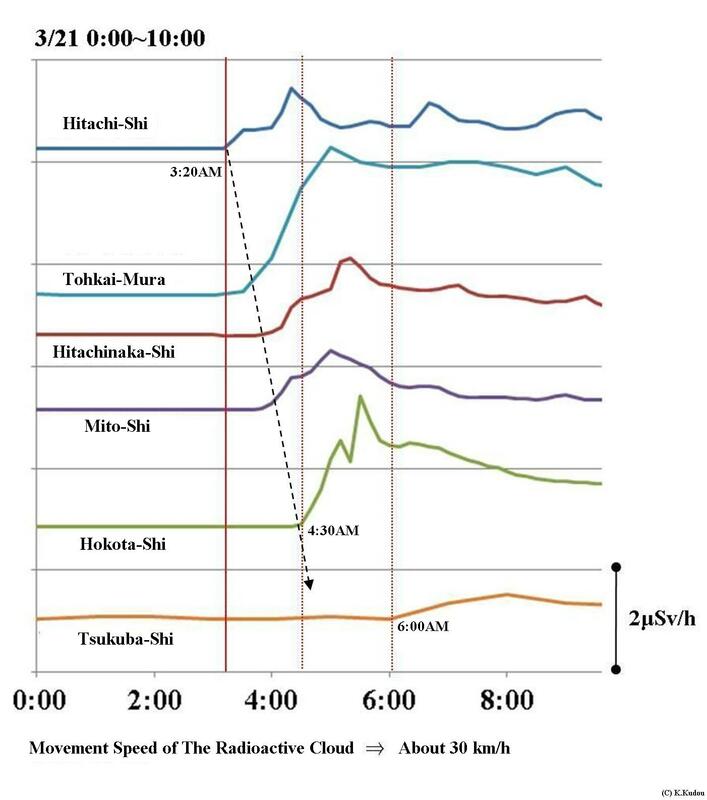 The radioactive cloud (following, "Cloud") observed in the vicinity of Tokai-mura at 4:00 a.m. , moved southwest (Fig.3). 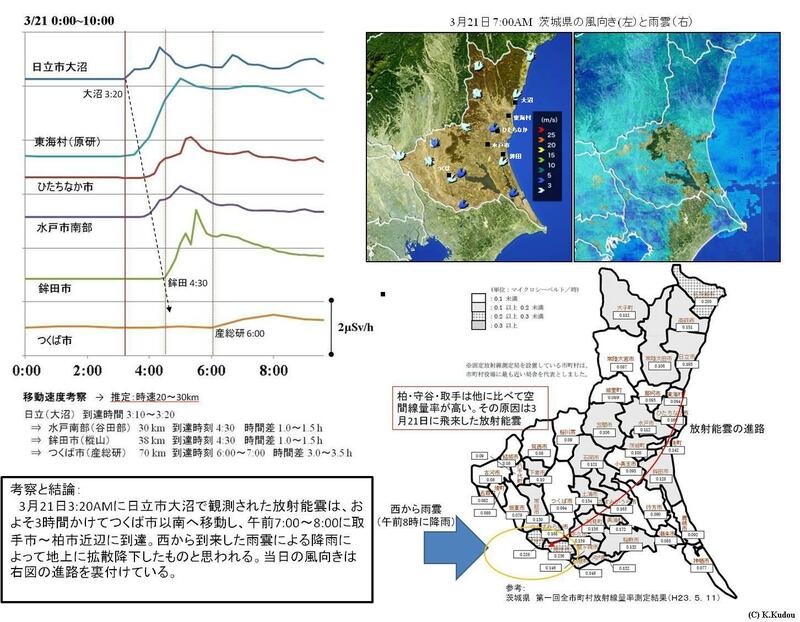 In the Fukushima first Nuclear Power Plant at this time, strong wind blows to the southeastern direction, and it is considered that "Cloud" detours around the sea and invaded in Ibaraki. A low pressure front came close then from the west, and the wind blew southwest so that it was breathed in. Because the movement speed of "Cloud" is almost the same as the observed wind velocity in those days, it is expected that the movement course of "Cloud" follows the direction of the wind (Fig.4). 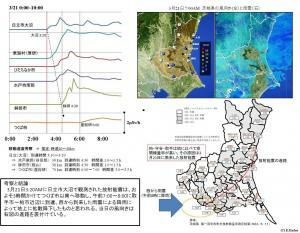 Consideration about the movement speed of "Cloud"
After the Mito-shi passage, "Cloud" moved to the south at 20-30km/h. 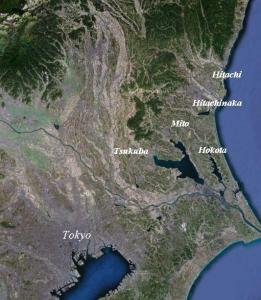 It is thought Mito-shi ~ Hokota-shi to have gone southwest. 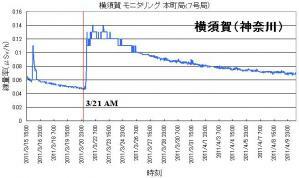 Therefore I plotted the space dose rate in the various places in Kanto at that time to a graph and considered the movement course. 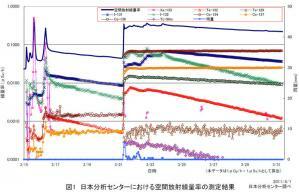 Fig.5 is a graph drawn by the pursuit of SC (Sudden Commencement) in each measurement point from Onuma-cho in Hitachi-shi. According to Fig.5, the first rise have been observed in Onuma at 3:20 a.m., gradually spreaded to Tokai-mura, Mito, Hokota, Tsukuba-shi. This is regarded as the result that "Cloud" was transmitted. A momentary rise is observed in Hokota-shi. It is thought that a nucleus (or center) of "Cloud" passed this and decreases after the passage (refer to simple illustration and Appendix-1). 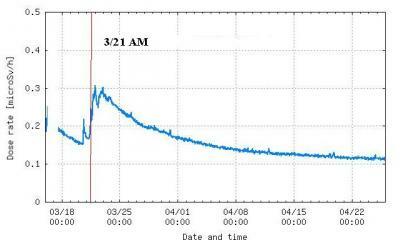 Rises more than double are seen after the passage of "Cloud" at all measurement points. 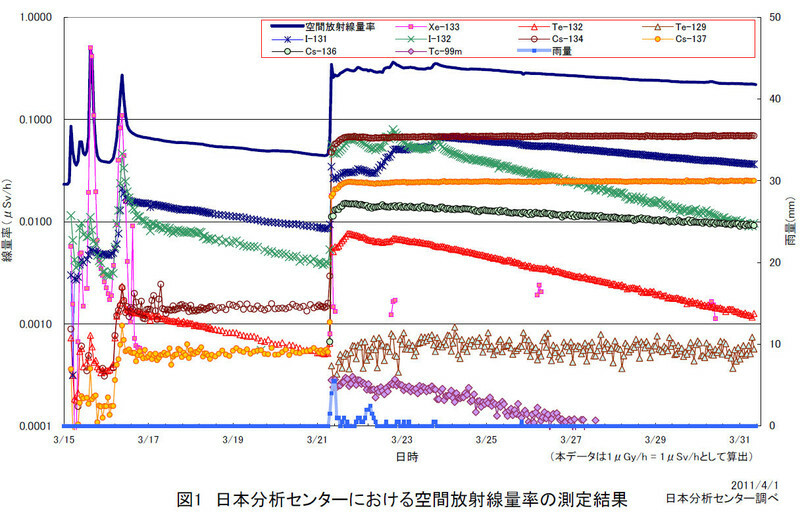 Fig.5 Plot (Onuma-cho in Hitachi ~ Tsukuba-shi, 21st from 0:00 to 10:00 AM) of each ground space dose rate. The arrival time: At Onuma, Hitachi-shi 3:20 at Tokai-mura 4:00 at Hitachinaka-shi (Katsuta) 4:10, southern Mito-shi 4:30, Hokota-shi 4:30. Appendix-2. Space dose rate (gammma-ray) by Tsukuba-shi KEK (High Energy Accelerator Research Organization). After sudden rise on March 21st, it is found to gradually decrease for a long term. This is why the radioactive material decreased by half-life. 3. Where did "Cloud" which toward the south land? Fig.6 shows the relationship between the rise in space dose rate and the precipitation. According to Fig.6, the rise by "Cloud" continues being very steep, on the other hand, the rise caused by the rain is relatively slow. 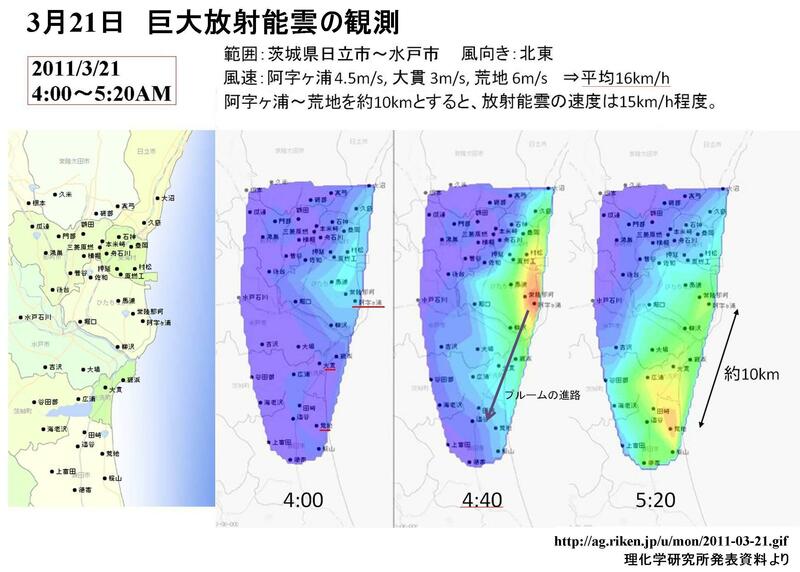 A dose rate also rises with the rain of 8:00 a.m. widely to Fukushima - Yokohama, but it is thought that the radioactivity nucleus collected in the sky was dropped by the rain. The increase of dose rate caused by the rain is seen by the everyday rain. The most causes is mostly Radon (Rn, or Bi-214). Most of the radioactive material does not deposit in this case, and "No Problem". 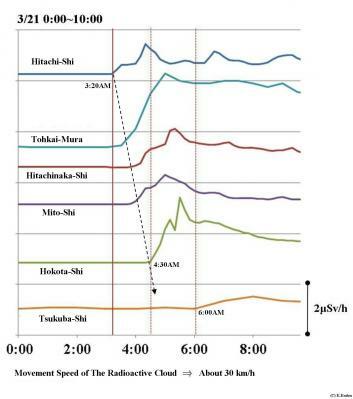 Fig.6 Difference between radioactive cloud and rise caused by the rain. 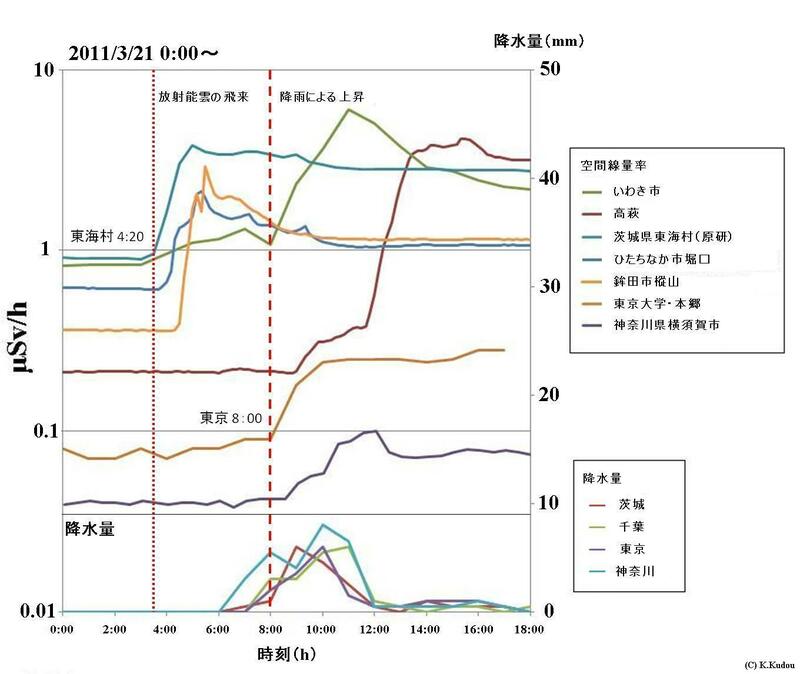 It is found that the radiation dose of each place increases by the rain of 8:00 a.m.
Judging from a conclusion, the radioactive cloud fall to the Kashiwa-shi neighborhood caused by the rain. 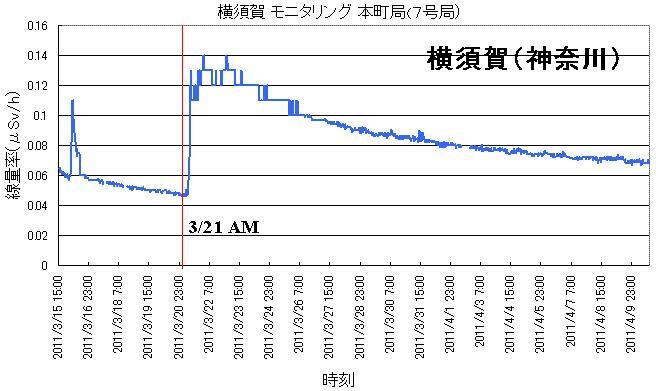 At first, because　"Cloud" moved at 20-30km per an hour according to the chain plot, if it placed at Tsukuba-shi at 7:00 a.m., it is thought that the sky on Toride - Kashiwa-shi at the time of the rain at 8:00 a.m. (Tsukuba-shi - Kashiwa-shi:Distance approximately 30km). Then "Cloud" clashed with the rain cloud which came from the west (Fig.7), and it is thought that it was dropped afterwards by the rain. 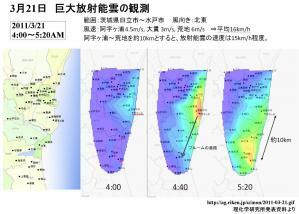 Probably the radioactivity that "a nucleus of Cloud" dropped around Kashiwa-shi - Toride by the rain should be huge. 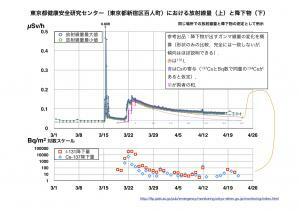 The predictive orbit of "Cloud" accords with a pollution area (Toride neighborhood) which Ibaraki measured recently. 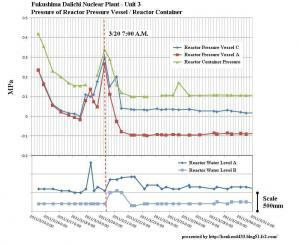 This is why the bomb of the radioactivity cloud impacted on March 21. 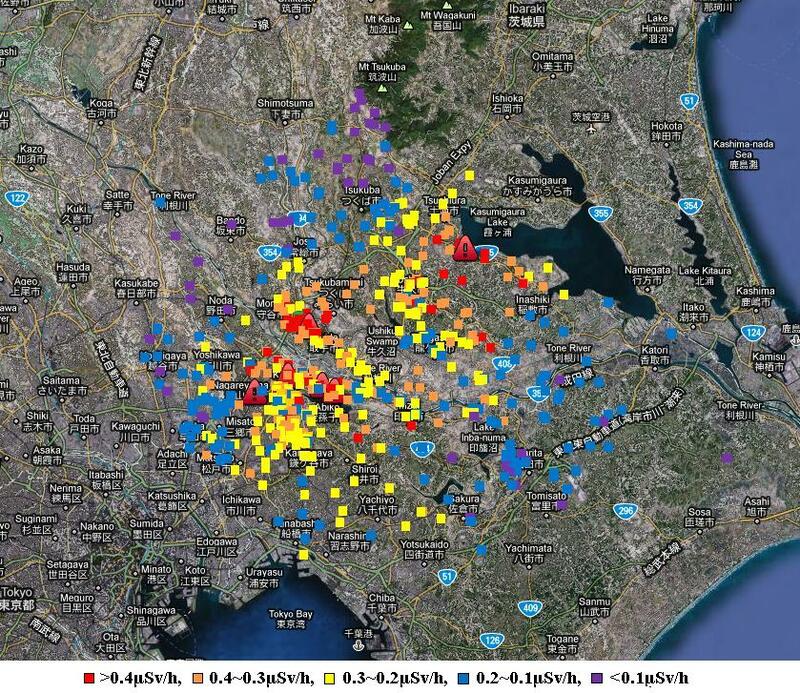 Actually, the space dose rate around Kashiwa-shi is called a "hotspot" with 0.2 - 0.5μSv/h (less than 0.1 in the others). This fact is checked by many citizens now. Fig.7 Orbit and impacted bomb point of "Cloud"
and collided with a rain cloud (low pressure from west). There was right on Kashiwa-shi at that time. 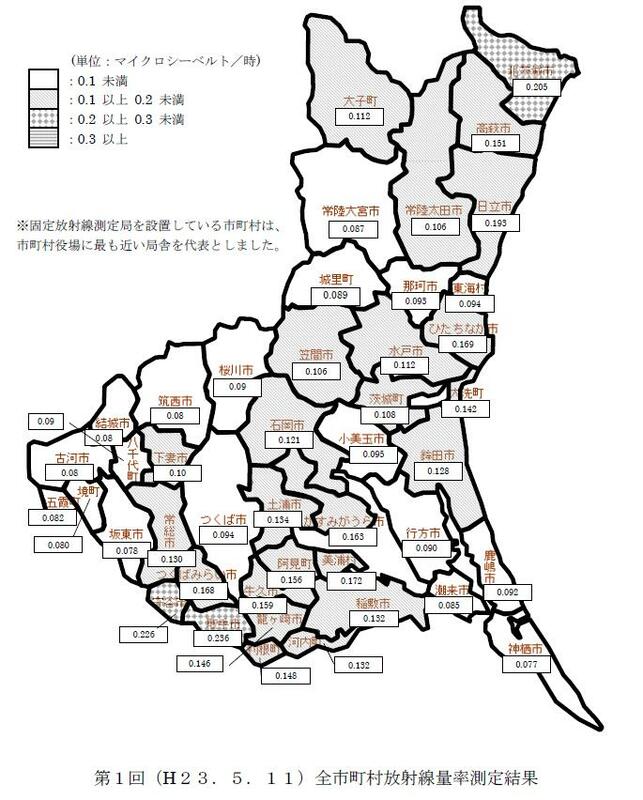 A dose rate is relatively high in Kashiwa-shi, Abiko-shi, Toride-shi area. 4. Where did the "Cloud" come from? What is the cause? 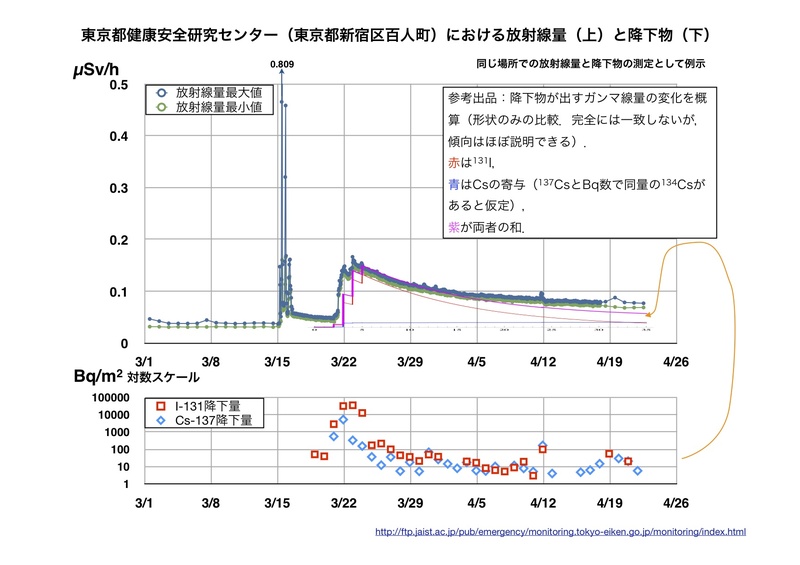 In the 3rd unit of the Fukushima first, the internal pressure of pressure vessel soars to 0.3MPa, afterwards, withdraw to atmospheric pressure (0.1MPa) rapidly. 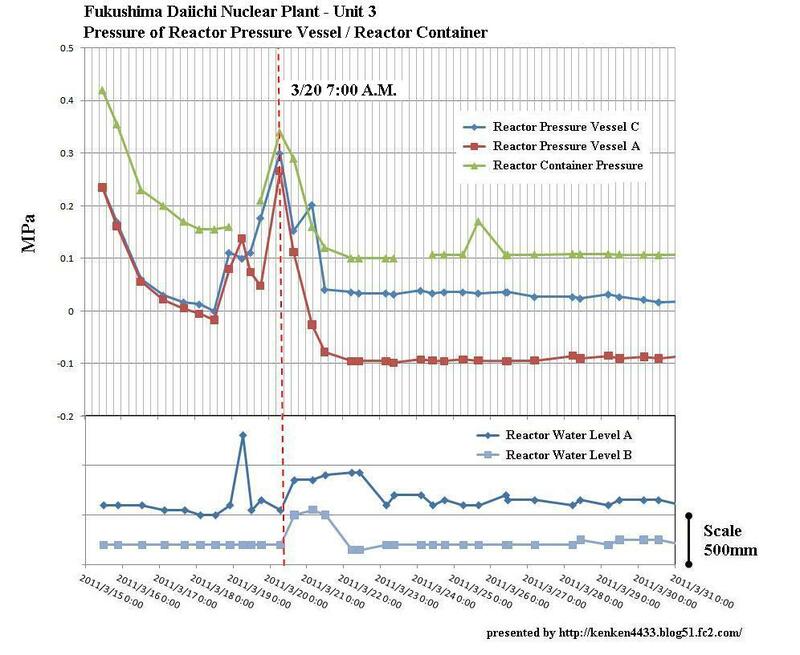 The Japanese authorities stated "what thought that it leaked from somewhere that pressure did not go up was natural" about a reactor pressure vessel　(RPV) of the Fukushima first Nuclear Power Plant 2nd and 3rd unit at a press conference of 29th, and mentioned the possibility that RPV was damaged. Copyright © 3/21 守谷市・柏市周辺を汚染した放射能プルームについて All Rights Reserved.